Ever since we announced Selena Gomez as our new brand ambassador in September last year, the first design collaboration between PUMA and the American singer, actor and producer has been eagerly awaited. Now, with the arrival of the brand-new Phenom Lux sneaker, the waiting has finally come to an end. 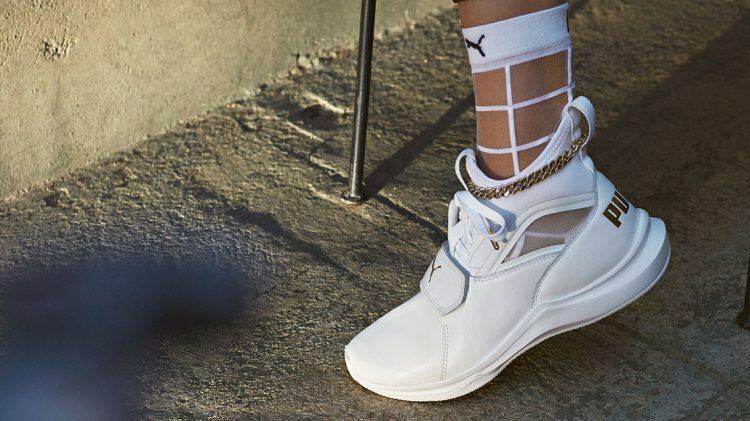 Merging true performance benefits with a fashion-forward look, the Phenom Lux is an elevated take on PUMA’s newest Phenom silhouette. The IGNITE foam and forefoot zones create superior energy return, giving you the power to make your move. The sleek style comes with a white leather upper with gold accents and a removable anklet. The kicks are best worn with a matching set of peacoat and white transparent window pane socks, an accessory which has also been designed by Selena Gomez herself. The shoe and sock set will only be released in limited quantities worldwide, so you better get your pair quickly. But the Phenom Lux is a shoe not only made to stand out, but to help out, too: Sales from the fashionable sneakers as well as the socks will benefit the Lupus Research Alliance, the world’s leading private funder of Lupus research whose mission is to find better treatments and ultimately prevent and cure the autoimmune disease. It’s been really fun to work so closely with PUMA on the design of this shoe. I’m also proud to partner with them in helping to affect lives and bring attention to a cause that is very important to me personally. So if you are walking in these shoes, you show the world three things. Firstly, that you have a damn good eye for flawless streetstyle. Secondly, that you love simplicity, mixed with just the right touch of bling. And thirdly, that you care for a good cause! The Phenom Lux and matching sock set will be available April 6th exclusively on PUMA.com and PUMA stores globally. Lupus is a chronic autoimmune disease that can damage any part of the body such as skin, joints or organs. In lupus, something goes wrong with the immune system, which is the part of the body that fights off viruses, bacteria, and germs. Normally our immune systems produce proteins called “antibodies” which protect the body from these invaders. “Autoimmunity” means the immune system cannot tell the difference between these foreign invaders and the body’s healthy tissues. As a result, it creates autoantibodies that attack and destroy healthy tissue. (Source: Lupus Foundation of America). In 2015, Selena revealed that she had been diagnosed with Lupus.